In Rick Riordan’s latest book, The Hidden Oracle, Apollo encounters a group of giant ants guarding the entrance to a sacred grove. These ants, the Myrmekes, are indeed part of Greek mythology, or perhaps more accurately Greek pseudo-history. The Myrmekes Indikoi, or Indian ants, were said by Herodotus to be ants the size of dogs that lived in the deserts of northeastern India. They were fierce creatures, but humans took an interest in them because they would dig gold dust out from the desert sands. People would ride out on camels during the hottest part of the day, when the ants were underground, to steal the gold. The Myrmekes would soon sense them, however, and come to the surface to give chase. That’s why humans would always approach with three camels, two male to serve as bait for the ants, and one female that had recently given birth, and hence would be extra fast because she wanted to get back to her babies. At least according to Aelian in the second century AD, the Myrmekes refuse to cross the Campylinus River, because they apparently observe similar rules to vampires and the Headless Horseman. Oh, and Herodotus says that the King of Persia has some captive Myrmekes at his court. Riordan remarks on how difficult it would be for such enormous ants to obtain enough food, with his Myrmekes storing carcasses of entire cows, deer, and horses. As with many fantastic creatures written about by ancient writers, there’s a theory that Herodotus might have mistakenly interpreted accounts of a more mundane animal, the Himalayan marmot, which would apparently sometimes dig up gold dust when burrowing. French ethnologist Michel Peissel suggested that the confusion arose because of the similarity between the Persian terms for marmots and mountain ants. This page has a good overview of Myrmekes. 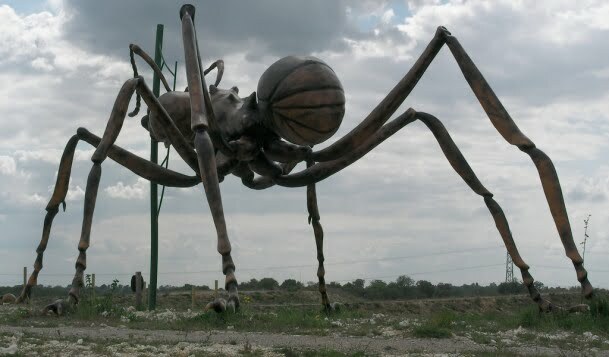 Another use of ants in Greek mythology involves the similarly-named Myrmidons, not that the similarity is a coincidence, as myrmex is Greek for “ant.” These were a race of soldiers originating on the island of Aegina in the Saronic Gulf. The island was named after a nymph with whom Zeus had an affair, the product of their union being King Aeacus. Hera, annoyed that not only did her husband cheat on her but actually named the island their son ruled after her, sent a plague that killed everybody but Aeacus himself. 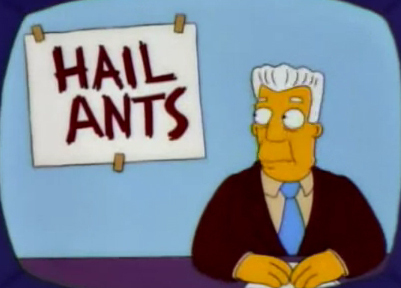 Longing for companionship, the king prayed to Zeus, who turned a bunch of ants into people. Having the collectivist mentality of ants, they were extremely loyal soldiers, obeying orders without question. Aeacus’ grandson Achilles led an army of Myrmidons during the Trojan War. Just about every sort of small animal has been made gigantic in fiction, but ants are particularly effective. They’re not much of a threat at their current size, but just imagine going up against a monstrous animal that has pincers, can spit venom, and is incredibly strong. Obviously the body structure of an ant wouldn’t hold up if enlarged to such a size, but fantastic fiction can find ways around that. In Mark Haas’s The Medicine Man of Oz, the ants of Anteria are specifically said to have been enlarged by Mombi, who intended to use them against the Good Witch of the North. She disappears before she can command this insect army, however. Herby and Trot use smoke to escape from the ants, and the Wizard of Oz eventually restores them to tiny size. The ants the protagonists encounter in Hugh Pendexter’s Wooglet are of normal size, but they can magically shrink people down to produce much the same effect. This entry was posted in Animals, Authors, Greek Mythology, Hugh Pendexter, Monsters, Mythology, Oz, Oz Authors, Rick Riordan, Trials of Apollo and tagged achilles, aegina, aelian, ants, hera, herodotus, king aeacus of aegina, mark haas, myrmekes, myrmekes indikoi, myrmidons, the hidden oracle, the medicine man of oz, trojan war, wooglet in oz, zeus. Bookmark the permalink.